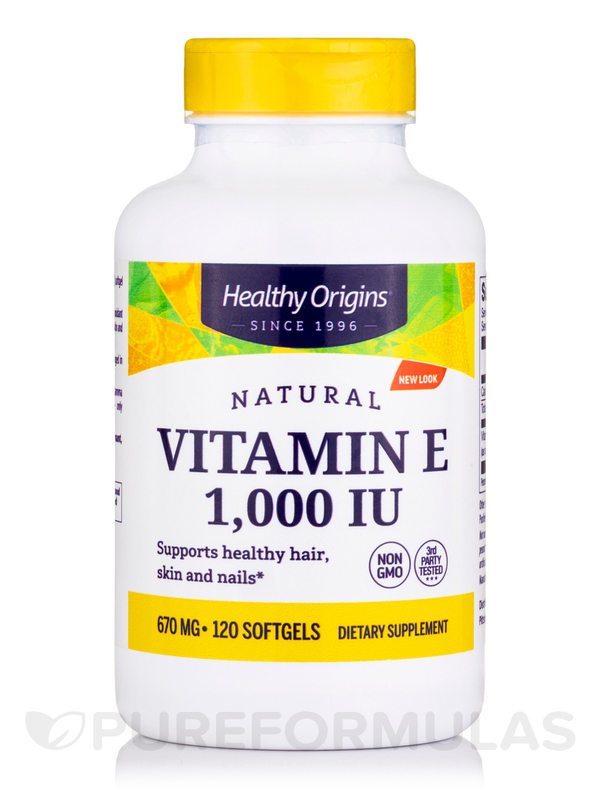 Protect your body from free radical damage and improve hair and skin health with Vitamin E-1000 IU (Natural) Mixed Tocopherols 120 Softgels from Healthy Origins®. 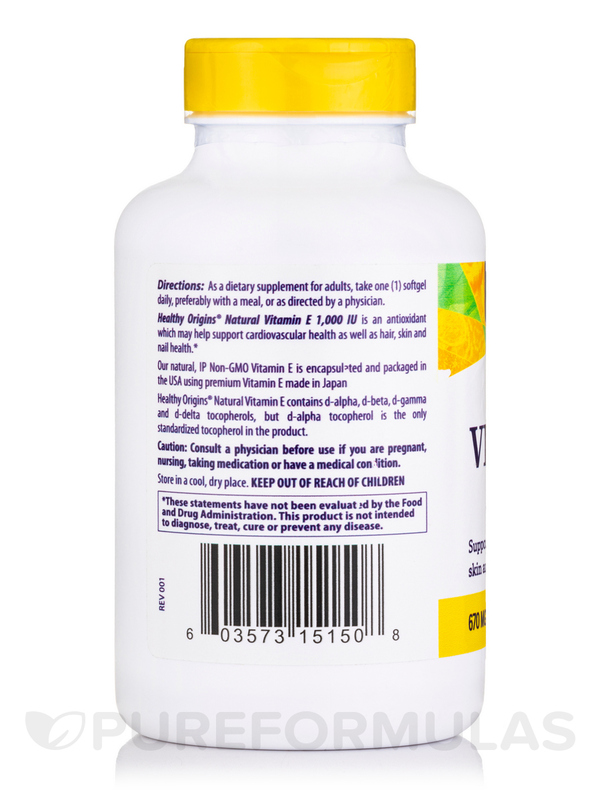 This dietary supplement is reportedly free of dairy‚ egg‚ fillers‚ gluten‚ fish‚ starch‚ yeast‚ nuts‚ sugar‚ salt‚ and preservatives. Vitamin E or d-alpha-tocopherol appears to improve circulation‚ promote cardiovascular health‚ and reduce leg pain. It may also support certain facets of cognition‚ alleviate respiratory conditions‚ and fight fatigue. Vitamin E could potentially keep blood sugar levels within range and prevent blood clots as well. Studies reveal that vitamin E also contains mixed tocopherols such as d-beta‚ d-delta‚ and d-gamma. This fat-soluble vitamin may maintain suitable hemoglobin levels in your body and reduce menstrual and menopausal discomfort. 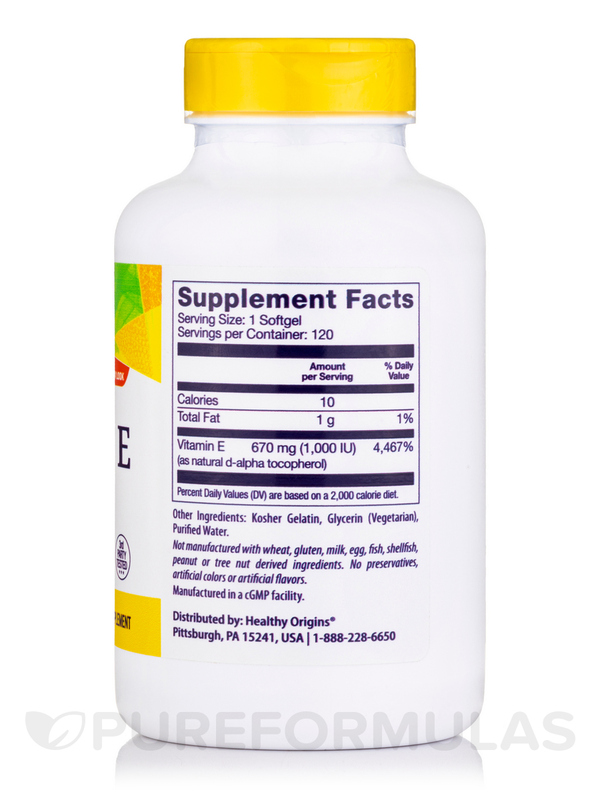 Vitamin E in this dietary supplement from Healthy Origins® could potentially boost your energy levels‚ muscle strength and physical endurance. It may fight signs of skin aging and keep your visage supple and radiant. 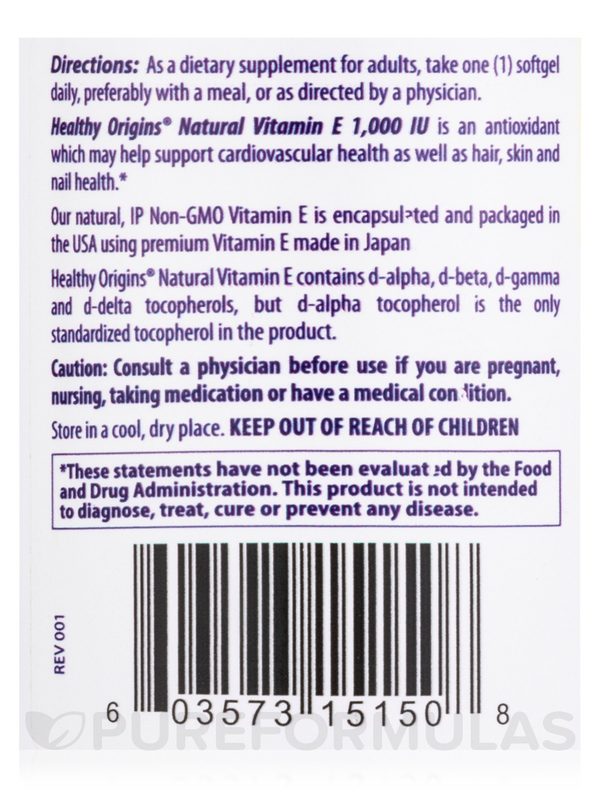 Make Vitamin E-1000 IU (Natural) Mixed Tocopherols 120 Softgels from Healthy Origins® a part of your daily diet and it could potentially stabilize cell membranes and guard the tissues of your skin‚ eyes‚ and liver from free radical damage. Percent Daily Values (DV) are based on a 2‚000 calorie diet. 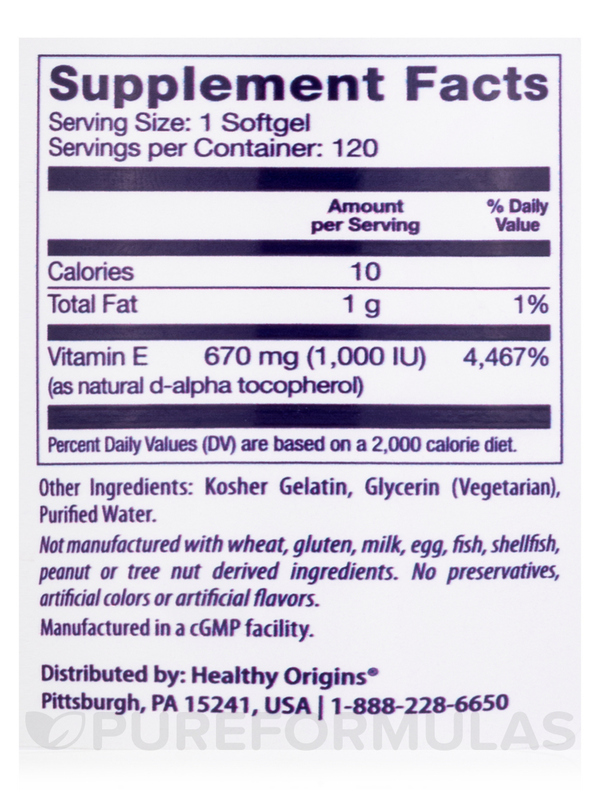 Does not contain sugar‚ yeast‚ wheat‚ gluten‚ barley‚ fish‚ shellfish‚ peanuts‚ egg or milk. No Artificial Colors‚ Flavors or Preservatives. As a dietary supplement‚ take one (1) softgel daily‚ preferably with a meal‚ or as directed by a physician.